Thankful.. I am so very thankful to all who bless me when they support my passion for crafting. Those who attend my card making classes (in-person or to-go), who host Private Classes with me, who shop with me and YOU for your popping by to support my blog (an extension of my passion for crafting and teaching it to others). These sweet and 'corny' (a-corny) hand-stamped cards are going out to those who have blessed me with support over the past couple of months (sadly I am behind in showing my gratitude). 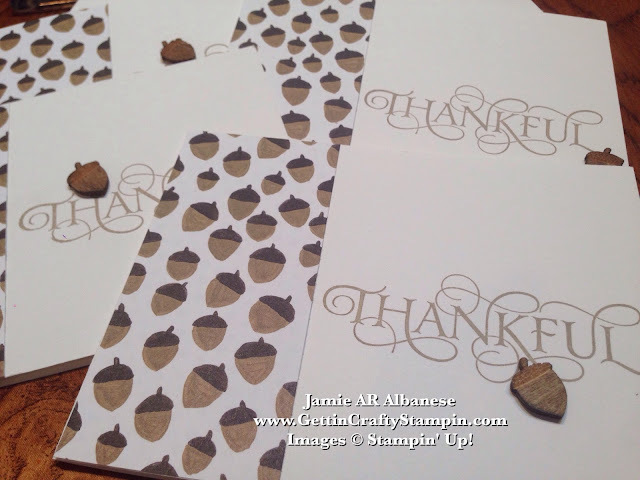 See how fun these hand-stamped acorn thankful cards are to create. Simple but elegant. 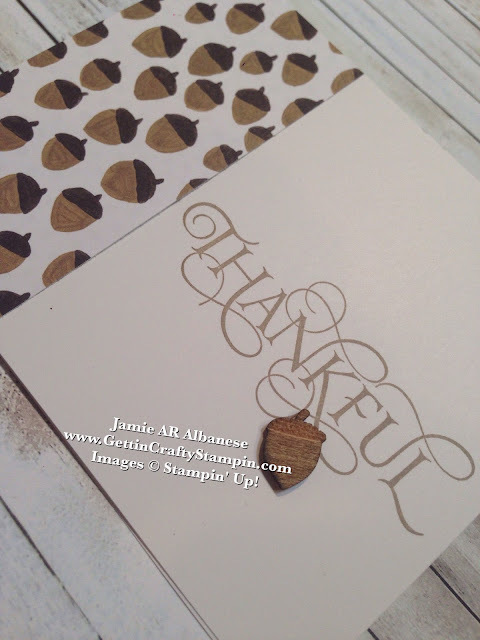 It is fun to create a hand-stamped card that while easy will deliver my gratitude. Here the Six Sayings Hostess-Exclusive stamp set is so lovely. Stamped with Crumb Cake ink pad on the Whisper White card stock. Accented with this cute and a-'corny' piece of Into the Woods Designer Series Paper. I love that this stamp set is discounted for all who host a Private Class with me or who Join My Team. I adore the Into the Woods Wooden Elements. They are so much fun to color in and make fit into my projects. Genuine wood is a light weight but on-trend and stylish accent to my projects. Here rubbing the wooden acorn pieces into the Crumb Cake ink pad (it needs to set and dry for a while). The laser cut accents take on a multi-colored look while coordinating perfectly with this hand-stamped card. Use the Glue Dots to secure them to the pretty card in a variety of ways. Create and show your gratitude with a pretty hand-crafted Thank You card. This is a stunning stamp set and at a great discount! 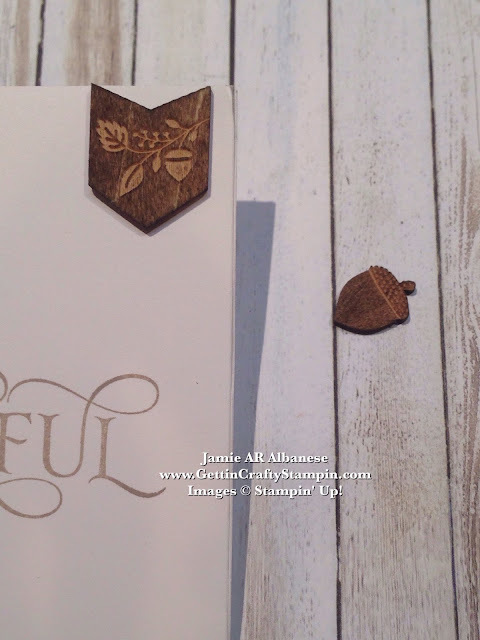 Simply created, this rubber stamped card is elegant and fun while being easy. I hope that this shows my gratitude for all who have joined me at recent card-making classes, supported me with purchases and for YOU as you enjoy my blog! Join us, in-person or to-go for card making and paper crafting fun!